There's magic in the number three. 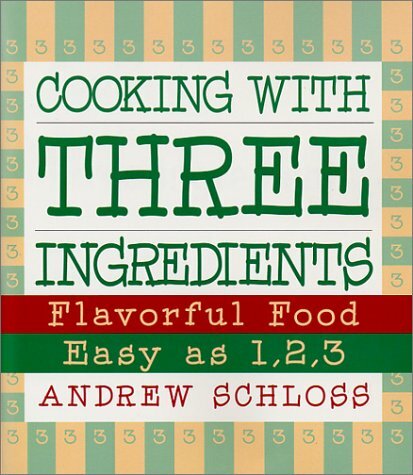 And when it comes to cooking, the number three can create culinary magic in your kitchen. In this fabulous, original collection, three ingredients add up to much more than the sum of their parts. Choose a simple starter, such as Smoked Salmon Mousse, Very Cheesy Nachos, Mustard-Cured Shrimp, or Chunky Corn Chowder, or go for the main event with Lemon Pepper Chicken, Balsamic-Glazed Sirloin, or Grilled Honey Mustard Pork. There are three-ingredient pasta sauces, delectable vegetables and sides, and even almost instant desserts. Using only three ingredients means less shopping, less preparation, less cleanup -- and best of all, less time. And with the many creative ways author Andrew Schloss has put these together, no one will guess that you haven't slaved for hours in the kitchen. You'll find these recipes exceptionally easy -- and unbelievably delicious.